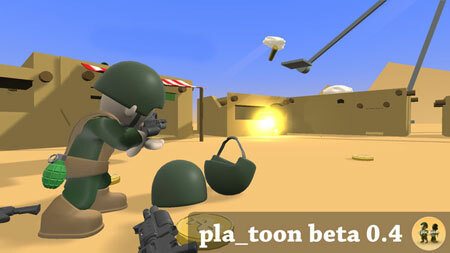 pla_toon is an action-packed multiplayer cartoon-style shooter from SoundAndFuryGames. You will play as a soldier in the game. Join the multiplayer battle and be the first to a para-crate drop to equip your player with powerful weapons. Or get on an ostrich and ride off into the sunset. Airplanes drop para-crates with powerful items in them throughout the rounds for the first player that reaches them. Players weapons can be shot out of their hands. Players belt grenades can be shot, making them expode instantly. Shooting a player with a bazooka at close range carries them away with the rocket, smashing though any walls in it’s path. The game features several game modes including DeathMatch, Team Deathmatch, Capture The Flag, and Co-op Base Defense vs. Bots. Currently there are two levels – Desert Town and Canyon Tower. If you get stuck in the game, check out the video walkthrough and gameplay for the game. This entry was posted in PC Games, Walkthrough and tagged pla_toon Cheats, pla_toon Game, pla_toon Gameplay, pla_toon Guide, pla_toon Hints, pla_toon Review, pla_toon Solutions, pla_toon Strategy, pla_toon Tips, pla_toon Walkthrough by Marvin. Bookmark the permalink.